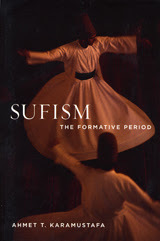 Ahmet T. Karamustafa bases this study on a fresh reading of the primary sources and, by integrating the findings of recent scholarship on the subject, presents a unified narrative of Sufism's historical development. His innovative analytical framework reveals the emergence of mystical currents in Islam during the ninth century and traces the rapid spread of Iraq-based Sufism to other regions of the Islamic world, providing an integrated, comprehensive understanding of one of the most compelling aspects of late antique, early medieval Islamic religious history. Ahmet T. Karamustafa is Associate Professor of History and Religious Studies at Washington University in St. Louis. He is the author of God's Unruly Friends: Dervish Groups in the Islamic Later Middle Period, 1200-1550 (1994) and Vahidi's Menakib-i Hvoca-i Cihan ve Netice-i Can: Critical Edition and Historical Analysis (1993), and co-editor of Cartography in the Traditional Islamic and South Asian Societies (1992).